Sports turns out to be entertaining. Being the Sports Editor for The Skyline View has been quite a game-changer for me on staff this past semester. Switching over from the title of Entertainment Editor, I feel that I could have a bit more of a creative side, as I’m guaranteed to have a color page and have a typical layout that remains similar for each print issue. Over the past few months I feel that I’ve gained more responsibility as just about every story is time sensitive in regards to sports, more specifically news and game coverage. Nevertheless, laying out my section with InDesign every other week has been a simultaneously enjoyable and tedious experience. Reason being that although my assigned stories aren’t usually completed and back at my doorstep until a couple or so days from print production. I end up with some great photos from my favorite photographer Renee, and these are used to assist me in text-wrapping my articles. 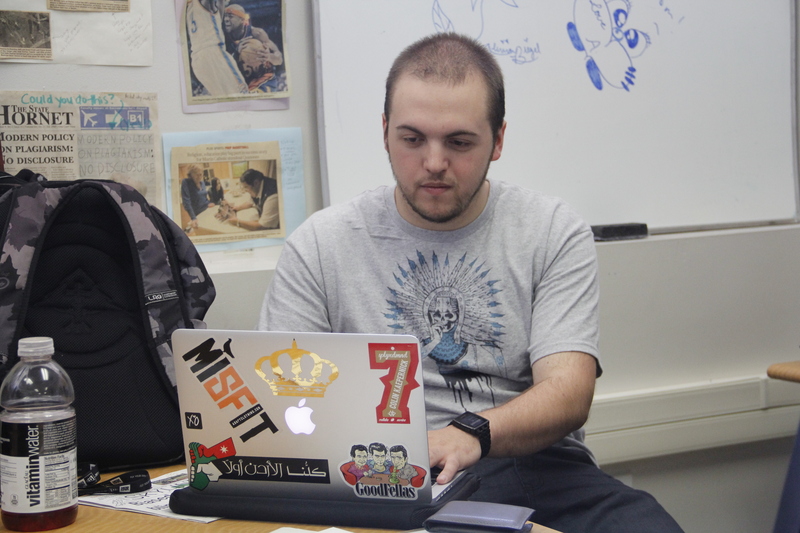 In reviewing each of our issues this semester, a small part of me misses being Entertainment Editor as I see how Ray has taken on my role and does a spectacular job each time he lays out. His work would have me thinking “Wow, why didn’t I think of that?” Specifically when he would print QR codes for stories that couldn’t make it to print due to lack of space. Despite my nostalgia for entertainment, I’m still glad that my adviser Nancy was able to convince me to leave my comfort zone and try out the position of sports editor. I also have come to realize that I’ve stuck with more Skyline-affiliated sports in my section, as I’ve limited the use of national sports leagues and opinion articles (unless they were necessary due to lack of published content). I’m not entirely sure if I’ll be back with a significant role on staff next school year, as I’ll have to proceed with completing units in order to hopefully transfer out soon. I will definitely continue to be a part of the staff though, even if I have to take 690. I’d love to be a tutor or assistant to current staffers that want to take on the role of a section editor next year. Until then, with two more print issues to go, we gotta finish this semester as strong as we started it. One editor’s road to a coveted role. Howdy! Allow me to introduce myself, as this is my first time writing for the TSV’s blog. (Don’t worry, this will lead into my topic of discussion). My name is Ray Garcia, and I am the 2014 spring entertainment editor of The Skyline View, finally, if I might add. (Told you! Also, hence the title). In the past I’ve been the sports editor and the opinions editor before that. But after a long wait, I’m finally the entertainment editor. Now what does the entertainment editor do you ask? Well, let me tell ya. I’m in charge of the Entertainment section, so I assign entertainment-type stories, (movie, music, and video game reviews, or anything else that is entertaining that needs to be reviewed), and then I lay out those stories on a software called InDesign as creatively as I want to. Now again, for a few semester I’ve been biding my time, waiting for the chance to finally get a shot at being entertainment editor. This has been something I’ve wanted to do since my first semester. Throughout my tenures as other section editors, I’ve been brewing ideas on how to operate and design the Entertainment section. So while I set up box scores for the Sports section during my tenure there, I also thought of incorporating a box office weekend results on Entertainment, which is just one of my many ideas that I have implanted this semester. I’m having a blast this semester. Not only am I the section editor that I’ve been coveting, but we’ve got a great staff this semester. Being able to work with these great individuals is highlight of my Mondays, Wednesdays and Fridays. Our very own blog editor, Shaq, and Production Manager Renee have helped me put my ideas on InDesign, and give feedback on my layout. As always, I would like to think that my section is the best looking one, even when I was opinions and sports editor, and by the feedback I get it sounds like I’m doing a pretty decent job, I guess. to the staff, and in the second class I attended the staff was already deciding which role they would take for the semester. I clicked random buttons and stuff, thinking back on it now I don’t know how I got through that. I was too shy to ask for help, so really I don’t know how I made it through. But of course I familiarized myself with InDesign and got more confident with the software. Up until now, I feel the most confident on my InDesign skills. And I have enjoyed every moment of being entertainment editor. I can now apply my sharpened skills and ideas into making a great section.